Feedback from my advisor workshops and client seminars coast to coast reveals that about 90% of investors spend their RRSP refunds. Helping your clients understand this and the 5 RRSP Refund Strategies is a big opportunity to add value to your clients, while increasing business. After fully understanding the issue yourself, here are some free and low-cost, ways to help advisors roll out the concept, to increase RRSP business 25-100%. 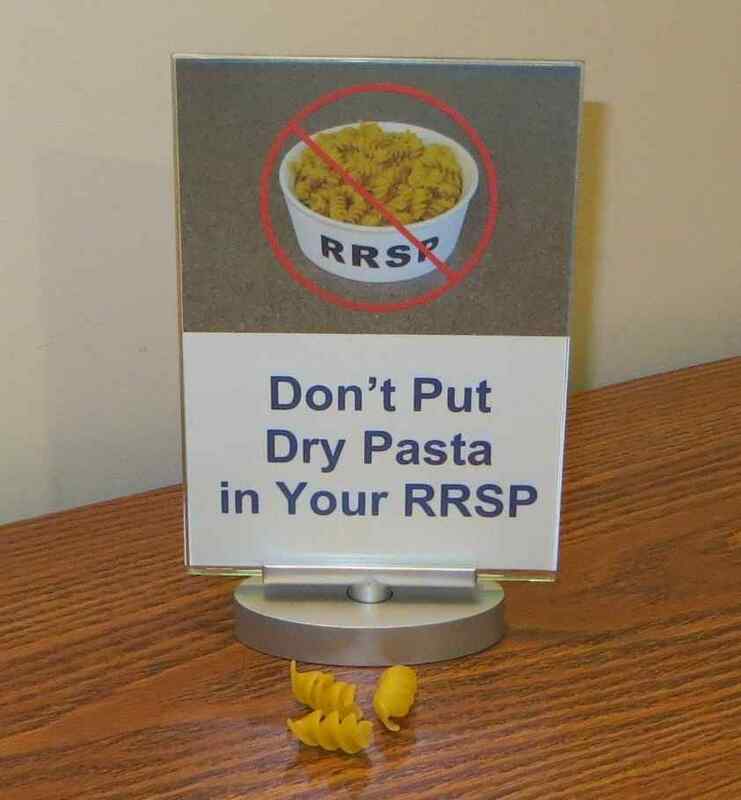 Email your clients "How Pasta Can Increase Your RRSP Income 25-100%". Click here for step-by-step instructions. Click here to view this HTML file, then press Ctrl-A, Ctrl-C to copy all of the content. In the body section of your email to your client list, press Ctrl-V to paste it. Modify the wording, as desired. If you are distributing a personally branded chapter (b-Book) of The Smart Debt Coach, change the link in the Next Steps to where you stored it. Mail this letter with a similar message, perhaps with your next statements. Use this storyboard to guide client conversations. Take the RRSP Pasta Challenge to increase your RRSP income 25-100%. Learn. Benefit. Share. Encourage clients to spread the word. The goal of the RRSP Pasta Challenge is not just to get all of your clients to contribute the full, equivalent, before-tax amount to their RRSPs, but to encourage them to share this overlooked, valuable concept with those they care about. Since most aren't aware of this concept, spreading the word is a good way for clients to help their friends, relatives, and co-workers, leading to referral opportunities for you. Put this Campaign Display Panel on your desk, ideally with some pasta in front of it. Clients will be curious and ask what it is about. You can get a Display Panel at Staples for about $12. Click here for a 5x7" PDF of this image. Use a Display Panel to introduce other campaigns periodically. Add value for referred friends, offering a free book. Giving away any good book that introduces client-first strategies that increase business is a cost-effective marketing approach. This is especially true if it integrates a "Help a Friend" message to also increase referrals, as The Smart Debt Coach does. The book retails for $25, but costs $10 or less, depending on quantity. Learn more. Distribute a branded PDF of the chapter, or book, via email or on your website. PDFs of the short chapters of The Smart Debt Coach (and my other publications) can be personally branded with your name throughout, so readers know who to help them implement the wealth-building strategies. Pricing includes unlimited distribution. Learn more.